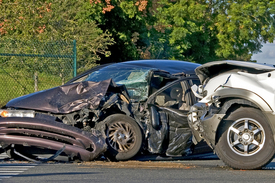 Auto accidents can be divided into two basic types: single vehicle accidents and multiple vehicle accidents. Single vehicle accidents involve only one vehicle, as the name suggests, while multiple vehicle accidents involve the collision of two or more vehicles. When victims of single vehicle and multiple vehicle auto accidents are not at fault for the accidents, they may be able to obtain compensation for the losses and expenses associated with their injuries by filing a personal injury claim in a court of law. If you or a member of your family has been seriously injured in an auto accident, whether single vehicle or multiple vehicle, and are in need of representation by an experienced Los Angeles personal injury lawyer, you have come to the right place. Attorney Edward Deason has extensive experience and an impressive history of success handling catastrophic injury claims arising from auto accidents of all types. He has the resources, skills, determination, and knowledge necessary to obtain the full measure of compensation to which you are entitled on your behalf. Don’t wait another minute to seek legal counsel; once the statute of limitations related to your case expires, you forfeit the right to seek compensation for your losses and expenses. To arrange an evaluation of your single vehicle or multiple vehicle auto accident case, please contact Edward Deason, our personal injury attorney in Los Angeles, today. If you have been involved in a single vehicle accident, and your auto insurance company is either denying or refusing to pay the full value of your claim, Edward Deason can help. He is willing to take on even the most powerful insurance companies, whether he is able to reach a favorable settlement or has to try a case to verdict. If you or a member of your family has been injured in a multiple vehicle auto accident, we encourage you to contact Los Angeles personal injury attorney Edward Deason today for an evaluation of your potential claim. He will fight for your right to compensation, working tirelessly to obtain the damages to which you are legally entitled.